Things are always different when you look from another perspective. 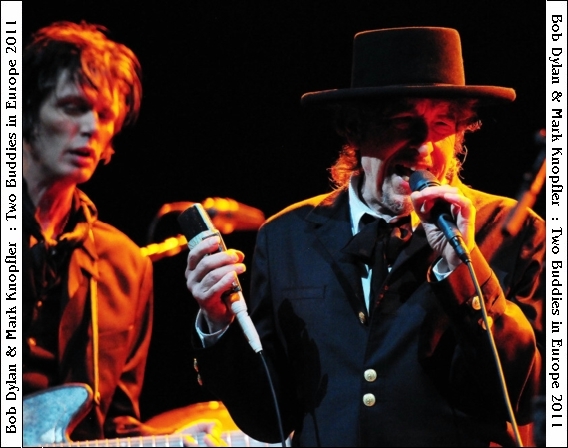 The first part of this Dylan-Knopfler story was beautiful, but incomplete. I told you how Bob and Mark met after a Dire Straits concert 29-3-1979,based on information from Clinton Heylin's chronology and my own research. Dire Straits performed songs from the self titled first album and the forthcoming Communiqué. So, it's not that strange that Dylan walked in at a Dire Straits concert before himself going into the studio to record Slow Train Coming. Also it's not that strange that Knopfler returned to Muscle Shoals in April/May after working there before in January under the same producers. Dire Straits was formed in 1977, the self-titled debut album was recorded the next year and followed by a successful tour. After among others the big WDR Rockpalast TV-show they toured the US the whole of March. It was at the second day in The Roxy Theatre on Sunset Boulevard in West Hollywood, on 29-3-1979, that Bob Dylan attended the show and met them afterwards. There he asked Mark Knopfler and drummer Pick Withers to join him for the recording of the Slow Train Coming album. The show that impressed Dylan consisted of seven songs from the debut album, six from the forthcoming Communiqué and one unreleased song. Most of them figuring in exchanging order in the succeeding shows. 10. What's The Matter With You Baby? 14. Where Do You Think You're Going? An available recording is unfortunately not of the best quality, but Bob liked what he heard. The Slow Train Coming album took one week to record, from April 30 till May 4 in the Muscle Shoals Sound Studio, Sheffield, Alabama, produced by Jerry Wexler and Barry Beckett in five sessions. Although there were 12 songs recorded, some in many takes, only two survived beside the official album. Only on single Trouble In Mind had one verse cut, but the complete version was bootlegged. Strange enough the complete text, with all six verses, was the one published. Ye Shall Be Changed was bootlegged too, but then bootlegged back by Bob for The Bootleg Series (Rare & Unreleased) 1961-1991, Volume 3. Several singles have the 3:57 radio edit of Gotta Serve Somebody (5:22 album version). It seems that the Brazilian single Precious Angle/Trouble In Mind has the full version of the last one. Anyway, the recent official Hanns Peter Bushoff compilation Pure Dylan: An Intimate Look At Bob Dylan (Sony Music 88697988082) has the complete track at last. All the tracks on the album have Knopfler and Withers playing besides Bob Dylan (guitar, vocals), Barry Beckett (Keyboards/percussion), Tim Drummond (bass), Mickey Buckins (percussion) the Muscle Shoals Horns and the backing vocals of Carolyn Dennis, Helena Springs and Regina Havis. At Olof's Chronicles (Still On The Road) is stated that the 3rd take of Gotta Serve Somebody is on the album and that all others (Greatest Hits Vol. 3, The Best Of Bob Dylan, Biograph, The Very Best Of Bob Dylan etc.) have the 1st take. To my ears it's all the same and the covers art says it is. A fault pas in such a extensive archive is easily made. Also the Precious Angel single is not mentioned.